This week’s bitcoin review focuses on the roller coaster that bitcoin decided to board as the week began. Oh, bitcoin. You had such a good run. During the past three months, the price of bitcoin had stabilized compared to the days after the fall of MtGox, floating somewhere between $550 and $650 for the majority of the time. 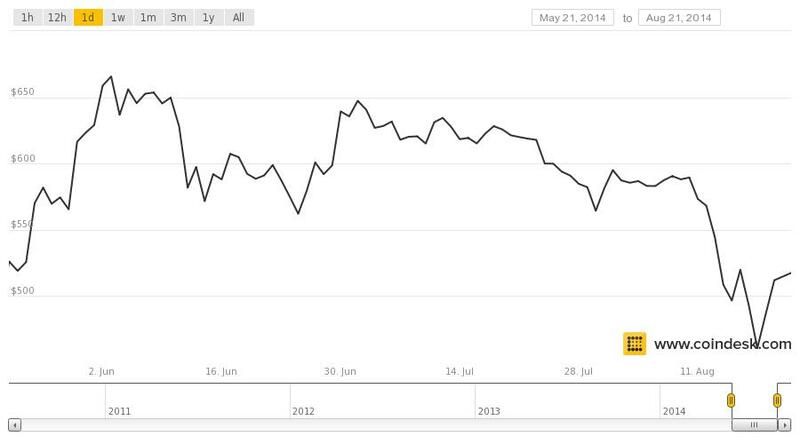 However, on Monday, bitcoin’s price took a big fall to a three-month low of around $435. It’s a roller coaster that those involved in bitcoin — and those who cover it — are familiar with. The price of bitcoin falls, dusts off its knees and peaks again. While “volatile” has become a favorite negative buzzword around the nascent virtual currency, each crash is a reminder that bitcoin is more than a replacement for the dollar or its blockchain technology. This week, the finger was pointed at margin calls for the cause of Monday’s crash. Both BTC-e and Bitfinex allow margin trading and experienced sudden crashes in their prices. Add that to impending pressure from the New York Bitlicense regulations and rising difficulty with mining, you have another dip in bitcoin price. As CoinDesk pointed out in a very thorough response from the exchanges, margin trading is just this week’s scapegoat. There’s a lot that can influence the market, from mining hash rates to margin trading to press coverage to social media, and bitcoin’s price has so far been susceptible to high levels of fluctuation. After Monday’s crash, the bitcoin price has returned to above $500. The price jumped 5.66 percent on Tuesday and another 5.18 percent on Wednesday. Thursday saw a steadier market, although it jumped as high as $532 before closing at $516.16. Bitcoin price was at $520.39 as of 10:00 AM PDT on Friday. Dutch bitcoin company BlockCorp has launched the BlockTrail, a new bitcoin analytics platform. Bitcoin took the stage at Y Combinator’s Demo Day. The digital currency was the theme of several startups, like BitAccess, which pitched to the audience of investors. Expect to see many of these companies in the bitcoin space soon. What happens to your bitcoin when you die? Delaware passed a Digital Access Act to try to clarify how our digital lives — including things like bitcoin or your [company]Facebook[/company] account — are handled after death. The comment period for the BitLicense regulation has been extended another 45 days — a move that many in the bitcoin community have been campaigning for. CoinDesk has an in-depth interview about the proposed regulations with Ben Lawsky, the author of the regulations, who reveals that some of the community’s chief complaints concerning software have just been a misinterpretation. The bitcoin net just got a little wider, too. Overstock.com plans to open up bitcoin payments to its international customers on September 1, reported the New York Times. Bitcoin has long been touted as a solution to remittance payments. The Guardian reported on how companies like BitPesa are working to transform money in Africa. CoinDesk has released a new bitcoin tracking tool: the Bitcoin Sentiment Index. The experimental tool uses data from Qruiosly to gauge how people are feeling about bitcoin’s prospects in the U.S. and the U.K. I agree with a lot of the points of the post. It’s important to remember that cryptocurrency is still growing, and there are still a lot of hurdles before it replaces our wallets — if that day ever comes. The question will be whether we try to force bitcoin to conform to our traditional view of currency (how will it factor into our credit score, entirely replacing our credit/debit cards) or if it will redefine our view of money/finance entirely.